Firstly, sorry for the poor quality of the scan, but I left it as is because I wanted you to see as much detail as possible. I did these both in my sketchbook and when I could see the inking was going south, I decided to redraw the image on the back of the same sheet. So I inked only what I needed, then turned over the page and blue penciled the inked lines then cleaned it up with my favorite purple pencil. I think it worked out pretty well. I have one problem and my Christine has a different one, so her's first: She doesn't like how the guy leaning against the tree has his feet placed. She says it looks like he's tied to the tree with his feet hanging. Good point, I can see that. I have a problem with the scale of the people. It looks to me that if they all stood side by side, the tree people would be much bigger. I think if I'd tapered the tree more in the middle, and/or added more ground detail to suggest more relief in the landscape, and/or drawn the ground people slightly bigger, everyone would have looked more in the same scale. Yep, your inking really sucked. Nice that we live in a world where we get second chances -- 'cause your new pencil drawing is great. I have no problem with the guy's feet, but I agree with you that there's a scale problem. You could probably fix it by tapering the tree trunk. I know, I know, tree trunks are fatter at the bottom and everything but - who cares?! - just taper it and your drawing will be flawless. Proof positive that it's flawless? How many drawings can be flipped and still look right? Yours looks perfect, either way! You've touched on something I meant to mention... Another reason why I thought flipping the drawing would be better - it makes a better, slightly more unsettling composition what with the tree people looking from right to left. That's funny - I get a different read on it. 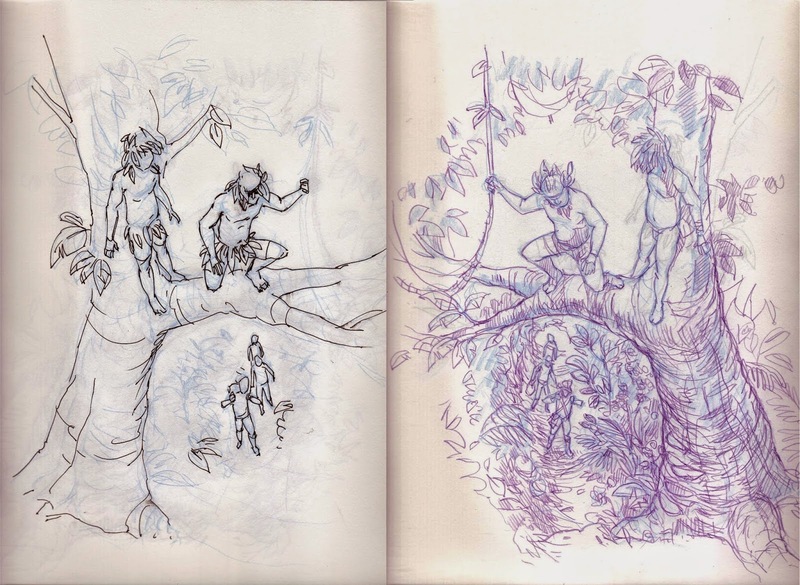 In your new composition, traditionally reading an image left to right, I see the people down on the ground and then I look up to the people in the tree. I'm "with" the people on the ground and I go "uh, oh.."
In your original composition, I see the people in the tree first and so I'm "with" them. I think "will they catch those guys?". That's the way I see it, anyhow. Interesting... I see your point and hadn't thought of the order in which you see the figures and how that might align you to them. I wanted the viewer to be "on the side" of the guys in the trees. The thing you've brought to light with these drawings is the most frustrating thing of all -- rough pencil sketches SO MUCH LIFE! And it's almost impossible to recreate that with a finished/inked drawing. Bah -- I hate that!